Yesterday morning, my synagogue president did something he doesn't typically do. He read an article from the morning's paper during his Shabbat morning announcements. 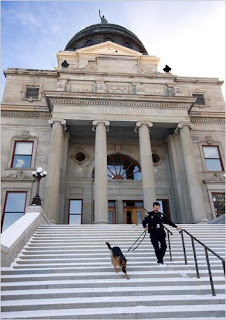 He explained that he was really touched by this heartwarming story from the New York Times about a police dog, a Chabad rabbi, and a menorah lighting in the Montana State Capitol. As soon as he finished reading the article, I knew the story would be going viral. And indeed it has. The story takes place in Montana, where in 1993 in Billings, vandals broke windows in homes that were displaying menorahs. In a response organized by local church leaders, more than 10,000 of the city's residents and shopkeepers put make-shift menorahs in their own windows, to protect the city's three dozen or so Jewish families. The vandalism ended thanks to the show of solidarity. The NYT article, written by Eric Stern (the senior counselor to Montana's governor), is titled "Yes, Miky, There Are Rabbis in Montana." Miky is the name of the police dog who made his way to Montana from Israel via Holland. In Israel, he was a bomb dog trained to respond to commands in Hebrew. Now in Montana, his police partner's Hebrew just wasn't up to snuff. And that's where the Chabad rabbi comes into the story. The Chabad rabbi met Miky the bomb-sniffing German Shephered at the State Capitol. The rabbi helped the police officer with his pronunciation of some of Mikey's Hebrew commands. They worked through a few pronunciations, and the rabbi, Chaim Bruk, is now on call to work with Miky and his owner as needed. Officer Fosket has since learned to pronounce the tricky Israeli "ch" sound, and Miky has become a new star on the police force. The two were even brought in by the Secret Service to work a recent presidential visit. So all is well in the Jewish community here because the Hasidic rabbi is helping the Montana cop speak Hebrew to his dog. It is good news all around. The officer keeps the Capitol safe, and the Hebrew pooch is feeling more at home hearing his native tongue. But the big winner is the rabbi, a recent arrival from Brooklyn who is working hard (against tough odds) to bring his Lubavitch movement to Montana. He has been scouring the state for anyone who can speak Hebrew, and is elated to have found a German shepherd he can talk to. This is truly an uplifting story as the Hanukkah festival approaches. If nothing else, it reminds us of the tiny Jewish communities in places like Bozeman and Whitefish, Montana. While I'm sure that the Chabad shlichim (emissaries) who are sent to these far off communities don't expect to be commanding police dogs in Hebrew, I'm also sure that nothing surprises them anymore. I thought the article totally made fun of the Jewish communities of Montana - did you know that there are SIX Reform congregations in Montana? And I super-resented the fact that the article said something about how a rabbi is an odd sight in Montana. All rabbis do not look like Chabad rabbis and all frum men are not rabbis! Great story! Nothing like the hebrew-speaking do in Montana.